They've suddenly appeared in Akron, 15 miles of them, one stenciled every 250 feet. 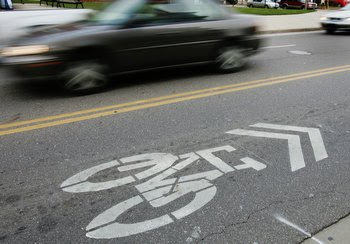 They are dubbed "sharrows," a combination of "share" and "arrow," and are there to remind drivers to share the road. Bicyclists are supposed to ride ON them instead of along the edge of the road, to avoid being clipped by a passing car or having a parked car's door open into you. Still to come: "Share the road with bicycles" signs. For more information, read this article from The Beacon Journal. I'm not sure of the wisdom of putting them on EXCHANGE STREET! Way too much car traffic for me to feel safe. I guess city officials don't cycle Exchange too often, I don't even like to drive it in a car at "crush" hour. I do applaud their vision however.